Landing a new job is a fantastic achievement, often the culmination of a lot of hard work. However, this is just the beginning; starting a new job is your next challenge and one you need to make a success of, and fast! Successfully transitioning into a new role is not easy; there are many potential traps and possible trip hazards you need to avoid along the way. Early in my career I found myself working for two bosses and, while each of them was a great leader in their own way, they each had very different ideas about what my role should contribute. I still remember the challenges of learning to balance those views and the dread with which I went into my annual appraisal, wondering if I had managed to deliver enough of each of their expectations. When you are starting a new job, especially if you are also joining a new organisation, you face that same situation, with everyone having different expectations about you and what you could and should be delivering. This very dilemma is the first transition trap you face; managing people’s expectations in a new environment. When you start, you don’t know the organisation’s language, politics, or cultural norms. Great management of your key stakeholders is going to be vital and those stakeholders should include your new boss, your new team, your new customers (internal or external) and your peers. And it is not just the people in your new organisation whose expectations you are going to have to manage. For a transition to be a total success when you’re starting a new job, it’s going to need to work in conjunction with other parts of your world, such as your family, friends and hobbies. Actively considering these and managing their expectations, and indeed your own, is also key if you are to avoid tripping up. As well as the potential transition traps set by others, there are a host of potential hazards connected the organisation. When starting a new job, you won’t know how the organisation works, what its processes and practices are, how they use technology or how they expect to collaborate and make decisions. And the final set of transition traps are all about you. Have you ever had a new colleague who soon alienated everyone by saying things like ‘When I was at my old company we did…’ and whose mind was not open to building on the good things your company already does? Or maybe one who just never seemed to learn about your organisation, or one who seemed to be trying to change everything before the end of their first week? As you can see, the potential transition traps are plentiful and varied, so how can they be avoided? The good news is that avoiding these traps can be relatively simple, and uses skills which you will be familiar with as a leader. Here are three steps you can take to navigate your way to a successful transition. Approach each day, each situation, each conversation with an open mind; listen to what is said and ask questions to clarify your understanding. Ask questions about the things that are not said. Remember you have a fresh pair of eyes and take a childlike curiosity into your new role and be prepared to ask about everything. When starting a new job, really listening to people will give you the foundations on which to build strong relationships with your new colleagues. As with any change, uncertainty can make people concerned and worried. You can help alleviate those fears by listening to understand, building up the people around you and showing them that you value them. Take time each day to review what you have heard to bring together the different things you have experienced. Capture what you are learning and ask yourself what it all means. As you get ready to plan, ask yourself what hypotheses are you forming about your new organisation? Based on what you have found out so far, what else do you need to know about? What questions do you still have and who is best placed to answer them for you? What can I contribute today? Both you and your new organisation have invested time and money in you starting in this new role, so you are both invested in your success. 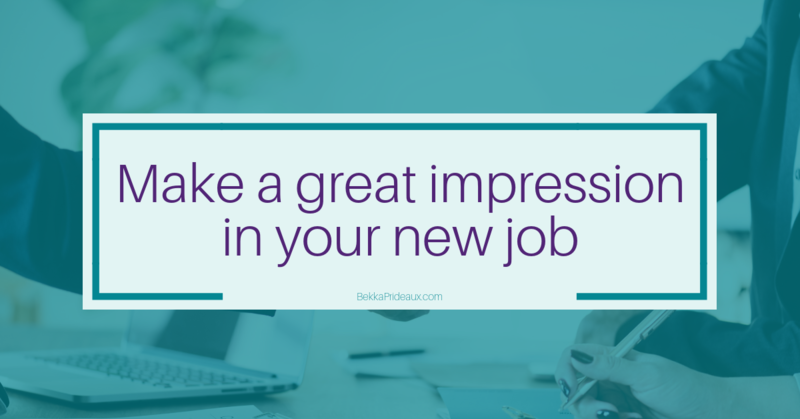 Approaching your new role in this way will allow you to avoid the job transition traps and position you to be a huge success, however you are defining that. While this three-step approach may look simple, like many things it is easier said than done, so it will require your conscious attention. The support of a coach, and ideally one who is not a member of staff at your new organisation, can really unlock this process. Research has shown that senior managers who have just five sessions with an external coach during their first 12 weeks with an organisation are considered effective in their role in half the time it takes for those who do not to get up to speed. They are making a positive impact in their new organisation by the end of that period and are twice as likely to remain in the organisation for more than 2 years.